Many states require that a certified copy be marked and authenticated with pre-determined notarial verbiage. After a notary has either personally made a photocopy of a certified document or determines a copy of an original document is a true and complete replica, they must note what transaction has taken place. If the document does not already have the notarial verbiage pre-printed on it, you will be asked to hand write all of the required information. Hand writing this required verbiage can be time consuming and messy. If you often find yourself in this position, we have a solution for you! Our Certified Copy Rubber stamp is 100% made and assembled in the United States and requires the use of an additional ink pad. This durable stamp have a very long lifespan and can be used for as long as your pad is well inked. Not sure if this is the correct stamp for your needs? Contact us! The Certified Copy Rubber stamp is a basic traditional wooden handle that will not break your budget. 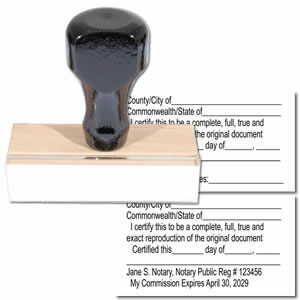 The Certified Copy Rubber stamp is made of quality American-made parts and is assembled by dedicated and talented team. Each rubber die is laser cut to ensure a great impression every time it is used. As long as you keep your additional ink pad well inked, your stamp will last indefinitely. This stamp is a supplemental stamp and cannot be used in lieu of your official notary seal or stamp.